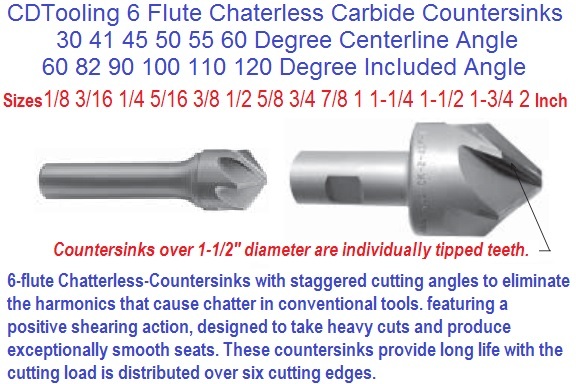 Single flute countersinks produce excellent results for light burr-free countersinking operations, are excellent at small hole chamfers, can operate at slightly higher RPM's, and may be reground many times. Other Diameters and angles can be provided as specials. Countersinks larger than 1" are not pointed, but have flat ends. 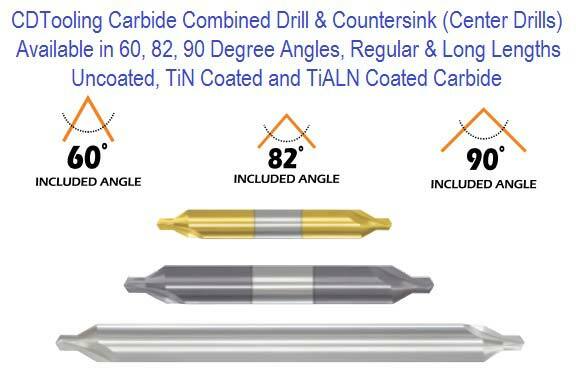 Designed for general purpose countersinking, chamfering and deburring in most ferrous and non-ferrous materials. 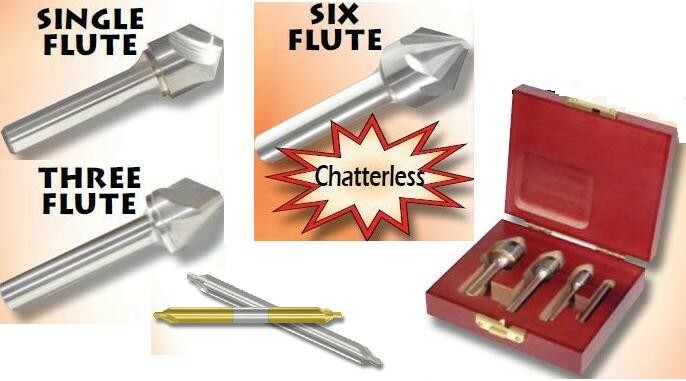 6-flute Chatterless-Countersinks with staggered cutting angles to eliminate the harmonics that cause chatter in conventional tools. featuring a positive shearing action, designed to take heavy cuts and produce exceptionally smooth seats. 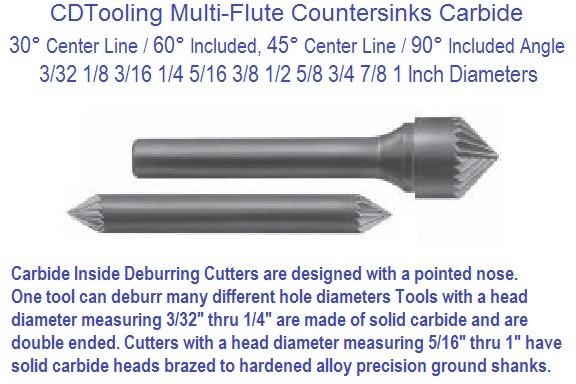 These countersinks provide long life with the cutting load is distributed over six cutting edges. Teeth as regularly furnished on these cutters are for quick light chamfering only. Stocked in 30° C/L and 45° C/L. The Inside Deburring Cutter is designed so that one tool can deburr many different hole diameters. The multi-flute design is self-piloting. 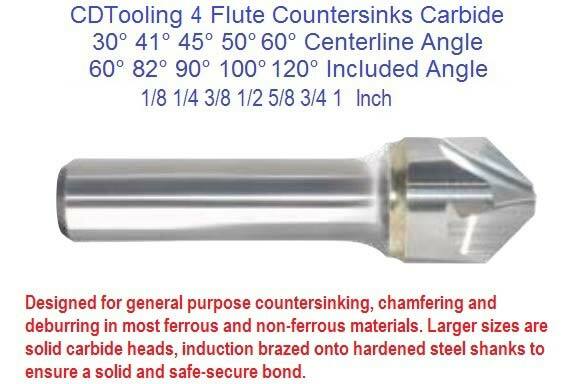 For heavier countersinking, special arbors, or special angles, submit details to our Engineering Department. 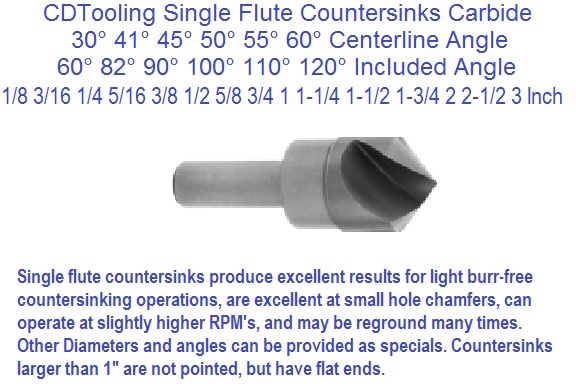 A countersink is a conical hole cut into a manufactured object, or the cutter used to cut such a hole. A common usage is to allow the head of a countersunk bolt or screw, when placed in the hole, to sit flush with or below the surface of the surrounding material. (By comparison, a counterbore makes a flat-bottomed hole that might be used with a hex-headed capscrew.) 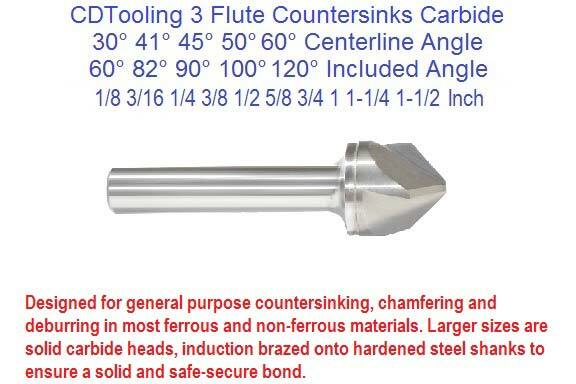 A countersink may also be used to remove the burr left from a drilling or tapping operation thereby improving the finish of the product and removing any hazardous sharp edges. 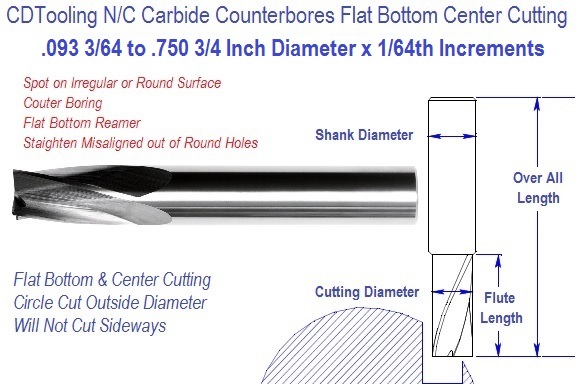 A counterbore can refer to a cylindrical flat-bottomed hole, which enlarges another hole, or the tool used to create that feature. A spot face is a very shallow counterbore. A counterbore hole is used when a fastener is required to sit flush with or below the level of a workpiece's surface.